Mobile phone smart locks, the Savior of obsessive-compulsive disorder! For obsessive-compulsive disorder, go out every day will tangle 2 questions: 1 keys with 2 locks? No? Sometimes obviously hurry to go to work, but still run back and forth a few times, until really determined to bring the key, lock the door to secure to work with hands! Intelligent door lock, it seems for obsessive-compulsive disorder can finally solve this problem! Why? Guangzhou Bai Jie electronic buddy today to introduce! Smart phone lock is what? Mobile phone intelligent door lock is a new product to achieve the most advanced 4 Bluetooth communication technology is safe and reliable, easy to use based on the Bluetooth intelligent mobile phone standard Bluetooth intelligent lock function, support Android4.3 and iOS4.0 version of the mobile phone, without the use of IC cards, optional support smart card, password authentication. Based on the financial level of the security design, the data for the AES encryption, to prevent air signal intercept. App and the cloud to carry out a comprehensive data verification design, safe and reliable, to ensure that data security. 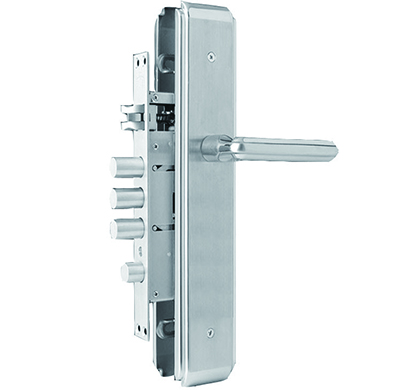 The protection level of the shell meets the requirements of 4208-2008 IP20 in GB. Support the operator to move the ring monitoring system remote, APP lock; no controller; support mechanical keys, electronic keys to unlock and provide lock alarm and record. Support for user needs to customize the function of related products. With independent design management cloud platform, APP, door lock core control all independent design, with the core technology, to fully meet the technical requirements of China tower. Fully meet the requirements of the tower base station access technology Chinese, has passed the tower company tender technical testing; at the same time support function, remote real-time monitoring of the function of opening the door, the door of real time event is sent to the server, will shift into the Internet era of animal intelligence lock. A lot of people there are still doubts about the safety of mobile phone for smart locks, then the mobile phone intelligent door lock really safe? With the development and progress of mobile phone, smart locks will be the future development direction of the lock, compared with traditional locks, security of mobile phone intelligent door lock is reliable! Also increases the convenience of more at the same time! Mobile phone smart locks also supports manual door in the traditional way, compatibility is also better! Of course, there is no absolute security in the world, can only say that the mobile phone smart locks are compared to most traditional lock is more secure, but also a more convenient and practical! Where can I buy a smart phone lock it? Since the mobile phone smart locks is really better than traditional locks, safer, more convenient, more reliable, so where can I buy a mobile phone? Smart locks is a relatively new intelligent Home Furnishing, so buy mobile phone smart locks suggest that you still have to find a regular factory! In this case we recommend: Guangzhou Bai Jie Electronic Technology Co. ltd.. The company started from the stage of product development, adhere to the quality first, service first "principle, introducing total quality management processes, to a high standard of quality control to improve the production process, each product is through professional testing precision. Continuous pursuit of high quality, so that the Bai Jie not only through the new version of ISO9001 international certification, but also to implement the comprehensive quality management (Quality Management Total) performance of mutual support. In Bai Jie electronics, quality is not only the basic principles, but also the pride of the spirit of the enterprise show.